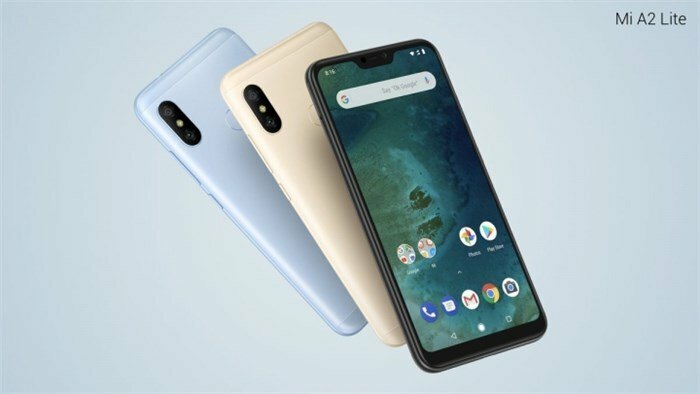 Just minutes after announcing the Mi A2, Xiaomi also launched the Mi A2 Lite Android One phone. The device is an “entry-level” Android One, which we will explain in a bit. The Mi A2 Lite phone flaunts a 5.84-inch Full HD+ 2280 x 1080 resolution notch display, with a 19:9 aspect ratio, 500 nits brightness, 432 PPI, 1500:1 contrast ratio, and an 84% NTSC color gamut.. The device is powered by a Qualcomm Snapdragon 625 processor. Xiaomi acknowledged that fans are mocking the company for continuing to launch SD625 devices, but maintained that the processor is still powerful, and ready for “entry-level” devices. The Mi A2 Lite runs stock Android Oreo, and will be available in 3GB RAM + 32GB storage/ 4GB RAM + 32GB storage / 4GB RAM + 64GB storage variants. The phone has a dedicated microSD card slot, which supports up to 256GB of expandable storage, and Dual SIM cards (Nano-SIM + Nano-SIM). The device is backed by a 4,000 mAh battery. 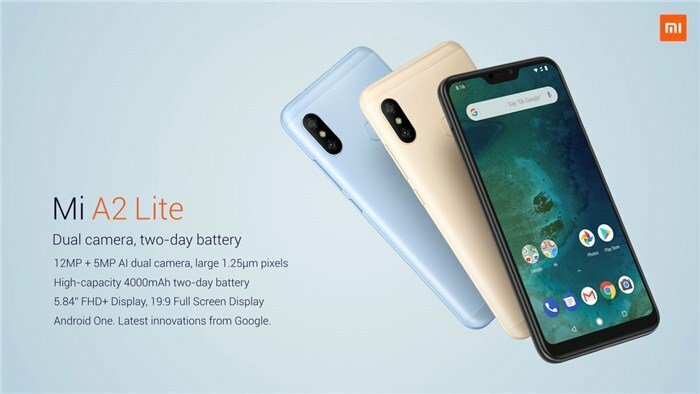 Connectivity wise, the Mi A2 Lite supports Wi-Fi 802.11 a/b/g/n, WiFi Direct, WiFi Display, 2.4GHz/5GHz Wi-Fi, Bluetooth 4.2, GPS, AGPS, GLONASS and Beidou. Sensors on the phone include an Infrared sensor, Electronic compass, Gyroscope, Finger Print Sensor, Accelerometer and an Ambient light sensor. In terms of the camera, the Mi A2 Lite sports 12MP + 5MP dual cameras, with 1.25μm pixels size, an ƒ/2.2 aperture, PDAF and AI Portrait mode. The selfie camera is a 5MP lens, with an ƒ/2.0 large aperture, and a 67.9° wide-angle lens and supports HDR, AI Portrait mode. The device will be available in 3 colours: Gold, Blue, and Black. The phone is expected to be available on August 10th in Spain, July 27th in France and August 8th in Italy. 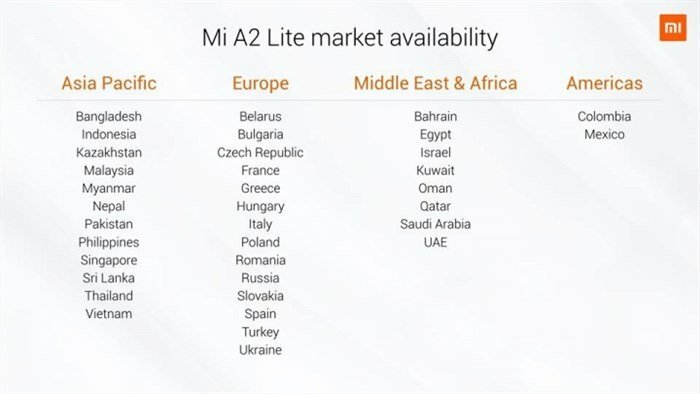 Sadly, it appears that the Mi A2 Lite Android One will not be available in India, Hong Kong and Taiwan.